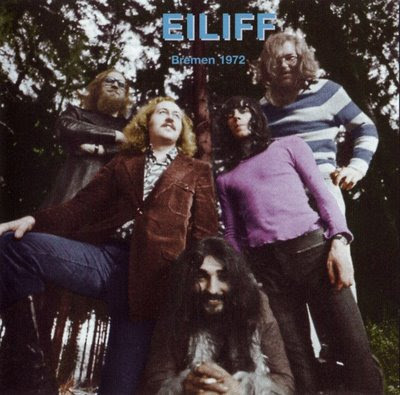 Eiliff were one of the so-called "progressive jazz rock bands" of the early seventies. Their two albums were recorded in Hamburg, produced by Rainer Goltermann. Their music is hard to describe accurately: a complex blend of many different styles, comparisons could be made with Colosseum, King Crimson, Nucleus and Miles Davis. With regard to German bands, perhaps a comparison with Xhol, Cornucopia or Thirsty Moon is appropriate. Eiliff also occasionally added ethnic touches, characterised by sitars and percussion. Their first album had the standard (for such bands) 20 minute suite, along with three mid-length tracks. Some sections were good, others sound a bit dated nowadays, particularly the jazz improvisations. In general, the album was a bit too diverse to make pleasant listening, incorporating as many different styles as it did. Eiliff recorded it in the Star Studios with Konrad Plank engineering. Their second and last album Girlrls! (1972) was closer to progressive rock otherwise it was quite similar to the first. It was recorded at the other famous recording studio of Hamburg: Windrose studios - with F. Bischoff engineering. Today Eiliff's albums are in the collector's mid-price rank of 60 to 80 DEM, probably justied by their musical content. After Eiliff's demise, Nejadepour played for a short while in Guru Guru at the time of Dance Of The Flames (1974).